96-Well White Plates | M1354 | BioVision, Inc. These are polystyrene microplates (white) with standard solid flat bottom, chimney well. 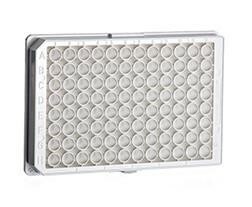 The flat bottom allows precise optics and the rounded corners allow pipetting without leaving a residue.